Image caption Theresa May says her plan is "in the national interest"
The UK wants to remain signed up to the European Arrest Warrant, Home Secretary Theresa May has told MPs. She said the UK would opt out of all 133 EU law and order measures in the Lisbon Treaty and seek to rejoin 35 of them "in the national interest". She rejected calls by Tory MPs to scrap the warrant, but said it would be reformed to exclude minor crimes. 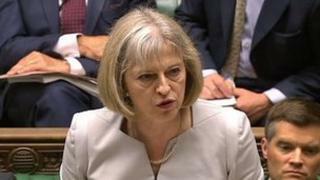 Labour said the announcement was "hardly a triumph of repatriation" and accused Mrs May of being soft on crime. To shouts of "shame" from Tory benches, Mrs May said Britain would rejoin the European Arrest Warrant, but said British law would be amended to "rectify problems and increase protections" for people wanted for extradition. "For reasons of policy, principle and pragmatism, I believe that it is in the national interest to exercise the United Kingdom's opt-out and rejoin a much smaller set of measures which help us to cooperate with our European neighbours in the fight against serious and organised crime. "I also believe that Her Majesty's government must strike the right balance between supporting law enforcement and protecting our traditional liberties. The European Arrest Warrant was used to bring back teacher Jeremy Forrest to face charges of abducting a 15 year old pupil. Critics say the warrant has led to the unfair trials of Britons abroad, including that of Andrew Symeou, who was held in a Greek prison for four years before being acquitted. "What I have outlined today will achieve both of those goals," she told MPs. Mrs May promised "additional safeguards" to stop the European Arrest Warrant being used to extradite British nationals for relatively minor offences. The Extradition Act will be amended to ensure that people can only be extradited if the country seeking them has made a decision to charge and try them, unless their presence is required to make that decision. The law will also be changed to make sure that British citizens cannot be extradited for acts that are not an offence under British law in cases where part of the conduct took place in the UK. She said the UK would also be seeking to opt back in to pan-EU intelligence sharing agency Europol, "provided that Europol is not given the power to direct national law enforcement agencies to initiate investigations or share data that conflicts with our national security". The government has tabled a motion for Commons debate next week on the conditions for rejoining Europol, to be held after a vote on the wider plan to opt back in to the 35 measures. Shadow Home Secretary Yvette Cooper accused Mrs May of a U-turn on the European Arrest Warrant, after previously suggesting it was not in the UK's interest. "Why has it taken the home secretary three years to realise we don't want to go back to the days of the Costa Del Crime, where British criminals could flee to Spain or European criminals could find safe haven here?" she asked MPs. Ms Cooper said many of the crime and security measures Mrs May wanted the UK to opt out of were no longer in use, had been replaced or had never been used by Britain. "The home secretary has tried to play Britannia, clothing herself in the union jack, parading powers that she is repatriating from Brussels, but where is the substance?" she added. She accused the home secretary of jeopardising the fight against serious cross-border crime by playing politics with the issue. The UK will require the agreement of the EU's 27 other members to be able to re-adopt selected measures. Some Conservative MPs have been critical of the pan-European warrant scheme, introduced in 2004 to speed up the extradition process for convicted offenders and criminal suspects across European borders. But the Lib Dems say UK participation in the warrant, which was used to detain and extradite from Italy one of those subsequently convicted of involvement in attempted bombings in London in July 2005, makes it easier to bring offenders to justice and Labour says ditching it would be "crazy". The European Commission said it "respects" the UK government's choice to opt out and "welcomes the UK intention to also opt back into certain measures". "The commission will clearly need to take the necessary time to assess the indicative list of proposals for opting back in that the UK has outlined. "The final commission position will be taken after the formal notification of the final list ie after 1 December 2014 and will be based on the criteria set out in the protocol, policy coherence and practical operability of cooperation in this area. "At first sight, it appears that the UK has looked at the opt-ins in a pragmatic way. The commission hopes that the UK can continue to contribute actively and pragmatically to the EU wide fight against organised crime and terrorism."